Obon is over. The final of the National Senior High School Baseball Tournament is to be held on August 20. We’re entering late summer! Do you remember JOI program I mentioned the other day? Six coordinators joined the 10th summer training held at Atlanta from July 27 to August 3, and have been sent to respective counterparts. In the summer training, they learned American history, educational system and lifestyle through lectures, and networked with coordinators who had joined the 9th training. They also practiced presentation to give at schools or libraries. Thanks to this intensive training, they’re now ready for conducting outreach and education activities to introduce Japan and Japanese culture! The photo above shows a trial class to teach “あいうえお” to the first-grade elementary school students, singing a Onigiri song. Isn’t it cute? I came across this advertisement at a supermarket I stopped by in a break time of the training. 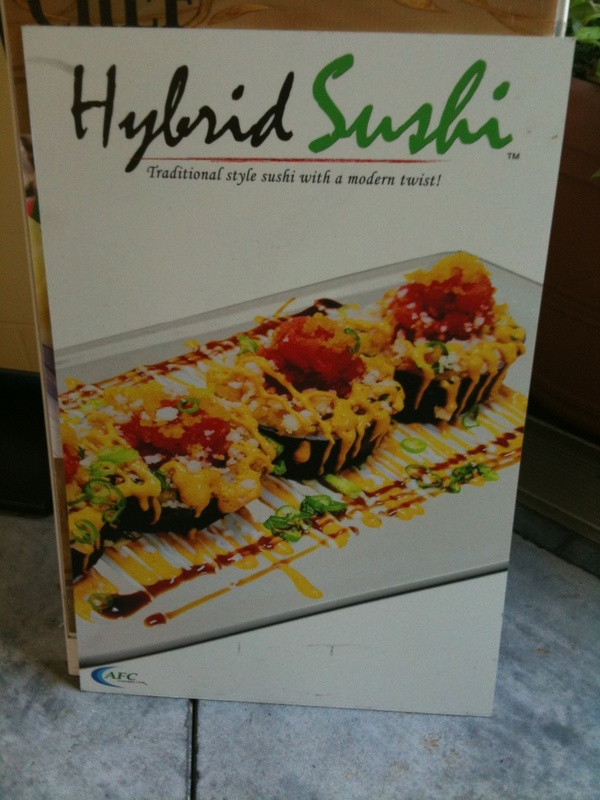 Hybrid Sushi…… I wonder how it tastes……??? I've heard coordinators now at work made “candy Sushi” for children. Japanese food is popular around the world. It’s interesting to know some changes are made to Japanese food in accordance with each country or region! Have you ever found hybrid Japanese food?